The process of building construction has been evolving since the introduction of Building Information Modeling (BIM) and Virtual Design and Construction (VDC.) Mobile and cloud technologies have now connected the field teams to precious data typically accessible back in the job trailer or office. Means and methods such as pre-fabrication, modularization, and material tracking are all becoming the norm. As you can imagine, these technologies and methodologies only work when these elements are integrated and coordinated with an extremely high degree of trust and confidence between all stakeholders. When things are all clicking, execution of construction tasks go off like a well-choreographed dance. Construction specialists are now enhancing a very important step in their dance, field layout and as-installed validation. By creating these highly accurate and coordinated models, contractors can now identify and locate all types of points in the virtual world and transfer or validate them accurately with their counterpart positions in the real world using laser precision. So, how are contractors making this all possible? They are replacing tape measures, strings, and plumb bobs with layout technologies such as the Topcon LN-100 robotic total station and Autodesk Point Layout point placement and construction layout software. Autodesk Point Layout (APL) plugs into AutoCAD, Revit, or Navisworks and allows for the strategic placement of points on the model elements so they can be exported for use in the field. Once in the field, the points are imported into a data collector which is mounted on a prism pole. The optics on the robotic total station tracks the prism mounted at the top of the pole. As the field technician moves with the prism pole, its position can be tracked visually on the screen of the data collector. As a point is located in the field, it is entered into the data collector as being located or collected. The most important first step of any field layout is establishing control. Control is the alignment of at least two points in the virtual world with the corresponding points in the physical world. When control is acquired, all future points can be shot and collected relative to those control points. 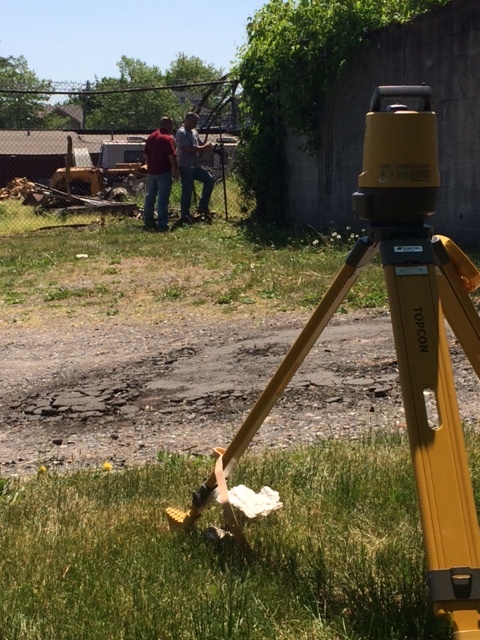 Surveyors know the importance of control when capturing existing site conditions. Therefore, they are the most likely partners in accessing coordinates to establish control. Civil engineers will take the data collected in the field and input it into their CAD application as a base survey. The coordinate system of the CAD file can be based on a state plane or known location in the field such as, an iron pin or monument.The same CAD survey file can be provided as a link inside of a Revit project to start the process. The CAD survey drawing will want to be linked use the Auto – Center to Center due to the CAD information being drawn in the World Coordinate System so far from 0,0,0. The CAD survey will typically need to be scaled 12 times to match the units in Revit. Now that the CAD survey is in Revit, the coordinates can be shared to Revit’s Survey Point (small blue triangle in the Site floor plan view.) The Revit Survey Point is used to reflect a shared and known geodetic point in the real world. It contains Northing, Easting, and Elevation for the shared coordinate system. As it stands, the known point in both files currently differs. However, Revit offers tools to resolve theses misaligned coordinate systems. 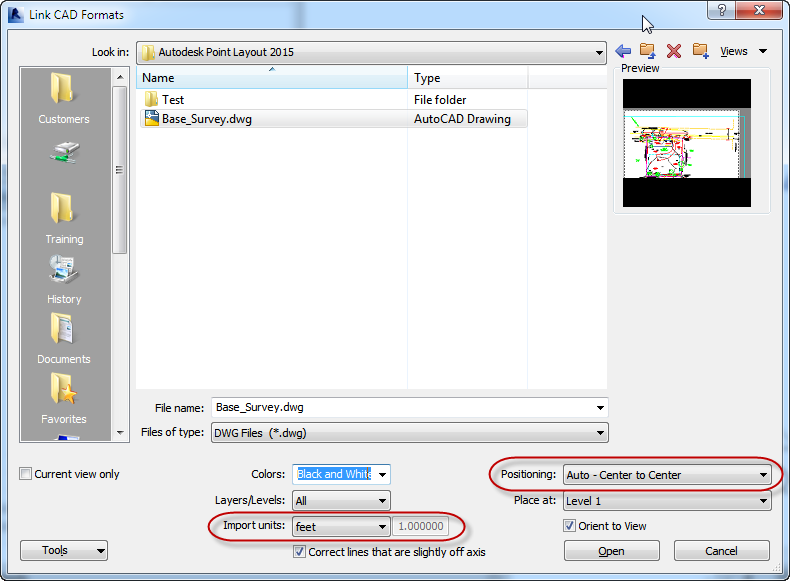 With Revit’s Coordinates tools, the Survey Point can be manually or automatically aligned to match a companion point in the linked CAD survey file. The easiest way to do this is using the automatic method. The Acquire Coordinates tool on the Manage tab can easily identify the coordinate system of a selected linked file and pull it into Revit. As soon as the linked CAD survey file is selected, the Survey Point relocates to the 0,0,0 point in the linked CAD survey file. As it so happens, the 0,0,0 point is miles away from the building site and to the southwest (this is typical as it keeps the Easting and Northing values positive.) 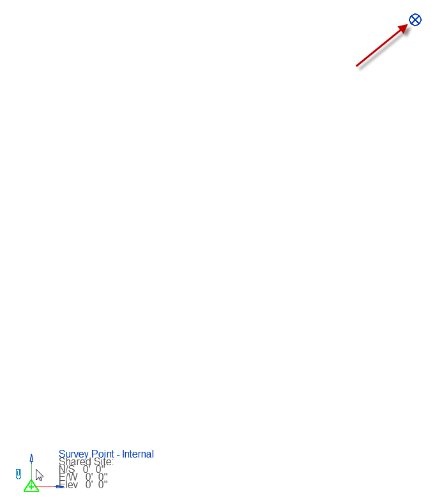 By leaving the Project Base Point visible, the user can Zoom to Extents to find the Survey Point. Once located, the Survey Point can be unclipped, moved closer to the Project Base Point, and reclipped. The manual method requires the user to first unclip the Survey Point, move it to a known point over the linked CAD file, input the coordinates using the Specify Coordinates at a Point command from the Coordinates tools, and re-clip the Survey Point. If that is not enough for you, APL can be used to setup a shared coordinate system too. 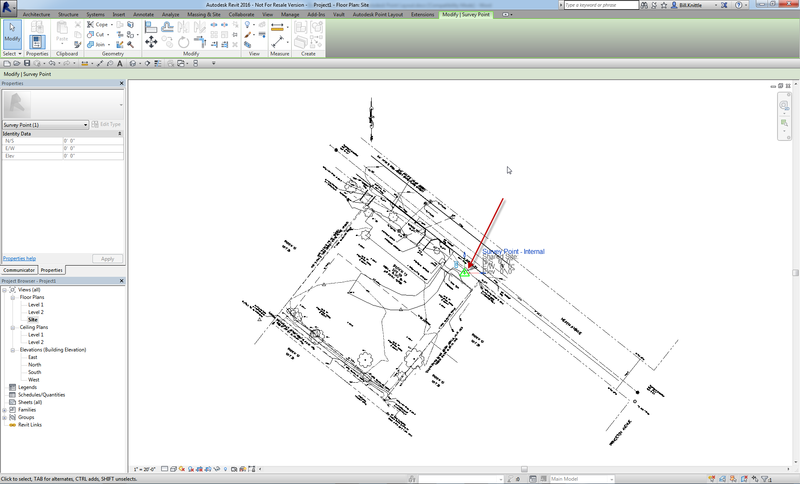 On the Autodesk Point Layout tab, the user can select the Coordinates command. A series of dialogs will follow allowing the user to input two known points X,Y,Z (aka Easting, Northing, Elevation.) Once they are input, the shared coordinate system is set and made current. 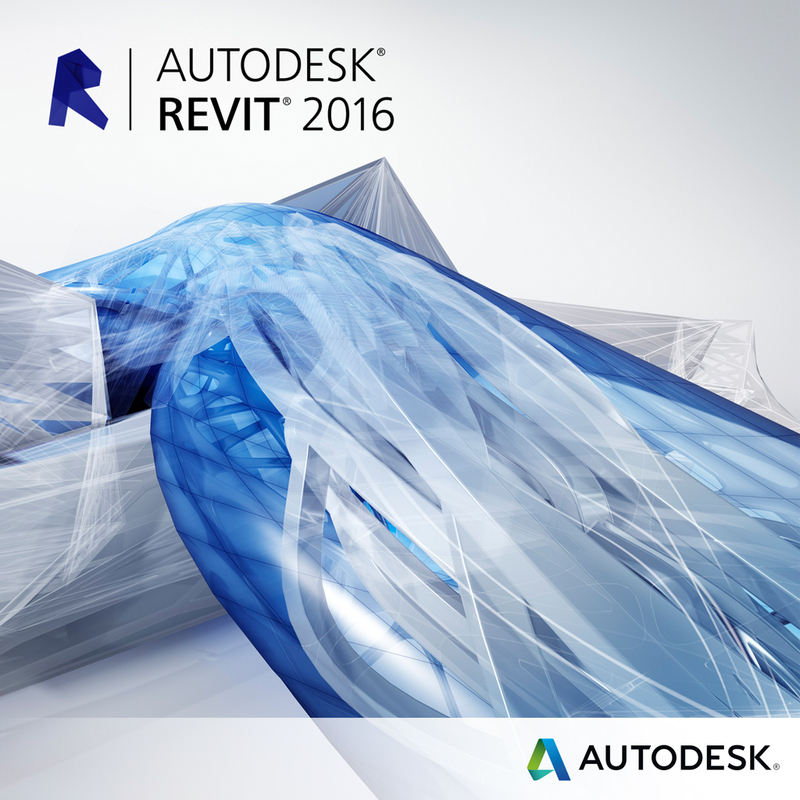 Once the shared coordinate system is established, this Revit file can be saved as the Site model. It is a good practice to keep the Building models separate from the Site model. The main reason is that it makes it easy to resolve alignment issues between he models. If the Site model is created separately from the Building model their coordinates need to be aligned too. One thing to note, modeling the Building model separately allows for it to be modeled orthogonally to Project North. To resolve the misaligned coordinates, the Building model needs to be linked to the Site model (which now hosts the shared coordinate system.) It is recommended that the Building model be linked in using Auto – Origin to Origin. Once linked, the Building model can be moved, rotated, or elevated into position using standard Modify tools. It is at this point that the same tools used to acquire the coordinates from the linked CAD survey file be used to publish those same coordinates to the linked Building model. 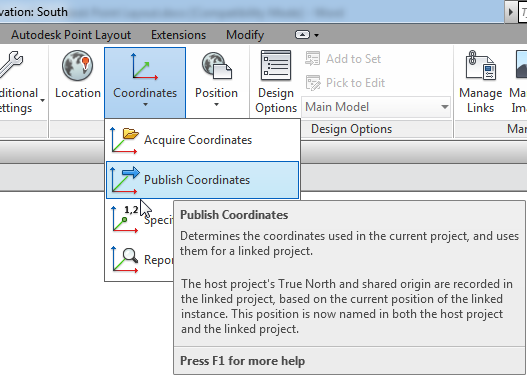 Using the Publish Coordinates command will push the shared coordinate system from the Site model into the linked Building model. Once published, the position of the linked Building model can then be saved back into the Building model file itself by using the Save Positions button in the Manage Links dialog. If the Building model is opened from this point forward, the Site floor plan view can be set to display the True North orientation while the other floor plan views can show the Project North orientation. 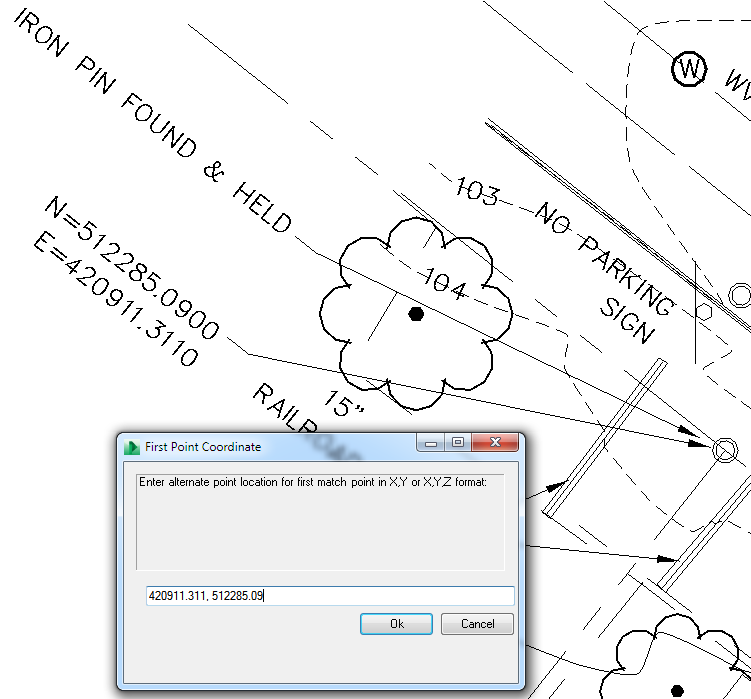 The Spot Coordinate and Spot Elevation commands can also reflect the shared coordinate values correctly within the Building model file. Now, let’s suppose that the Building model in this example is just the architectural Revit model. In most cases, the architectural Revit model is linked into other Revit structural, mechanical, electrical, and plumbing models. 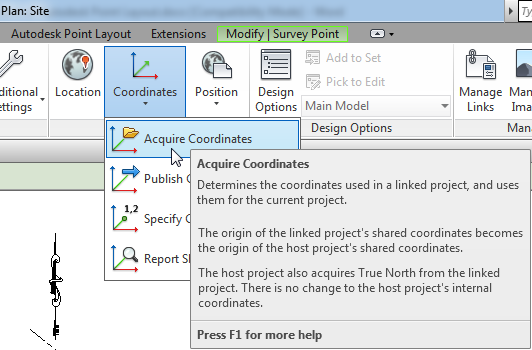 Therefore, the engineers’ Revit models could use the Acquire Coordinates command to pull the shared coordinate system from the architectural Revit model. 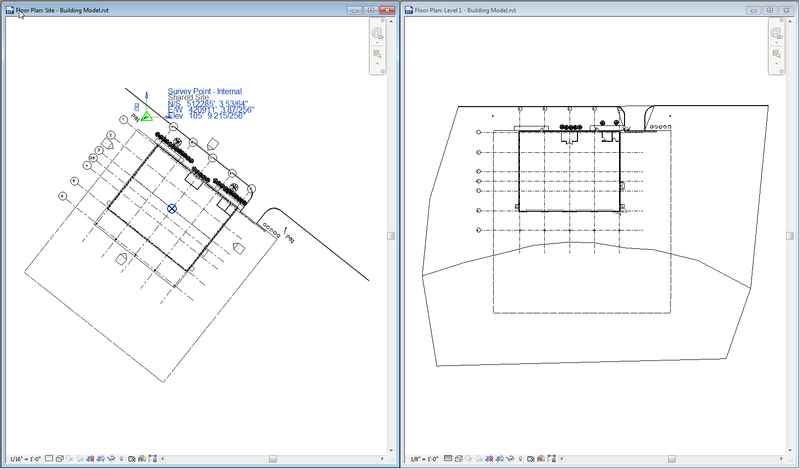 If sub-contractors are using AutoCAD-based applications, Revit views can be exported as CAD backgrounds for referencing. Within the Modify Export Setup dialog, the Shared Coordinates can be published to the exported CAD file. The exported CAD file can be used as an external reference within the CAD application. 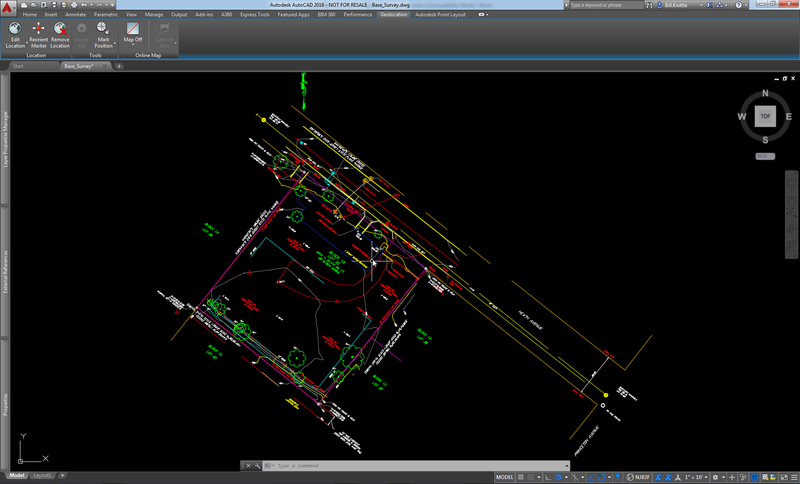 Even Navisworks will inherit the shared coordinate system from Revit models when exported to NWC. Within the Navisworks Options Editor for Revit dialog, the user can specify which coordinates are exported in the NWC file. Revit RVT files can also be read natively in Navisworks. Within the internal Navisworks Options Editor, the Revit file reader can be modified to read the shared coordinate system. In either case, the models appended to Navisworks will expose the shared coordinates to the APL add-in for Navisworks. This makes adding any additional points to the federated model quick and easy. As you can see, Revit’s powerful coordinate system tools provide the user with the confidence that coordinates and control can be achieved and synchronized across many formats and files in order for Autodesk Point Layout to be effectively utilized. The above approach, unfortunately, has some limitations. Can I suggest you consider engaging the below framework which is a project-wide solution for projects where the Lead Designer is using Autodesk Revit. It clearly defines all parties roles and how building relocations are to occur.